Please call me on my personal mobile number if any rogue views appear on our profile. Landscape front and rear garden. Professional service from start to finish, thanks to everyone involved. Highly recommend . 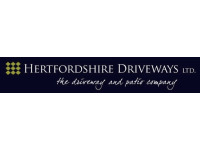 Hertfordshire Driveways Ltd were instrumental in designing and installing areas of our Outside Classroom at the school. They were very generous with their time and expertise. The installation went very smoothly and they were a pleasure to have on-site. I would certainly recommend them to others.